Wunderkammers, literally a ‘cabinet of wonders,’ are generally viewed as the precursor to the natural history museum, although such collections also spanned the breadth of human endeavor from art to anthropological artifacts to religious relics. Wunderkammer embody an approach to knowledge of the world different from the logical methodology of modern science or the defined, coherent realm of the contemporary art gallery. The wunderkammer, in all its baroque glory, assembled the disparate manifestations of the material world and assembled them into a single menagerie where each piece could be seen as simultaneously separate from the collection and intimately twined into the whole. 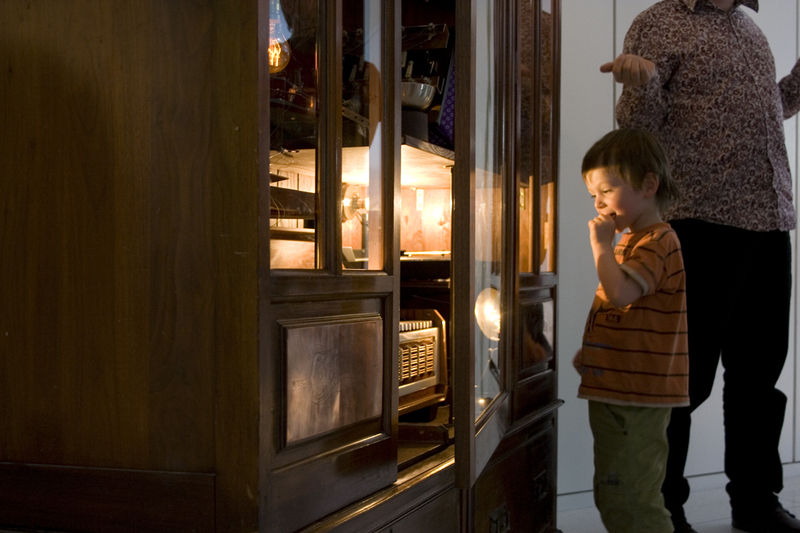 Keeping the idea of the wunderkammer in mind, I was struck by the similarity of a new telematic artwork, a contraption entitled the Cybraphon, and the ideas esposed in Anna Munster’s book Materializing New Media. The Cybraphon is wooden display cabinet created by the art collective FOUND, housing behind its glass doors a collection of brass apparatuses and musical instruments. Topped off by three gramophone speakers, the whole affair is decidedly Victorian. It would not look out of place in the Teylers Museum, Haarlem’s pean to the obscure scientific instrument. However, the Cybraphon is not simply a display case for arcana. Whenever an admirer draws close to the cabinet, the array of instruments strikes up a tune, one of several songs programmed into the machine. 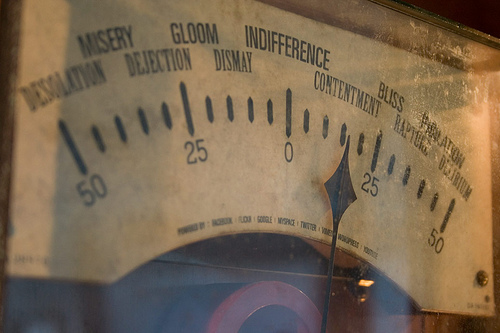 What music it plays is dependent on the Cybraphon’s ‘mood,’ indicated by the emotions printed on what was previously a 100 year old galvanometer. The Cybraphon is not actually a relic of an earlier industrial era, but is instead a complex entity with motion sensors, robotic keys, and an internet connection. The robot’s mood lifts and falls dependent on its online popularity. Like the wunderkammer, this piece assembles the disparate stories and threads of the world and attempts to integrate them into a single location, except, in this case, those threads and stories are mentions of the Cybraphon from websites, online reviews, Flickr, Twitter, and other social networking sites. This popularity machine is a perfect embodiment of Munster’s understanding of the baroque as an important alternative approach to contemporary interactive and telematic media. As she says, “Baroque modes and devices of visual display, such as curiosity cabinets…and the appearance of scientific specimen alongside mythical beast in early modern science illustration, have been connected with the navigational meandering…that comprise online experience…” (pp 9). In this case, the baroque model of ornamentation, obfuscation, and a nonlinear approach to cataloging information is in opposition to the approach to digital art and virtual reality that emerged out of 1990s (pp 90). With a few notable exceptions, the development of digital artwork and the internet itself out of ‘geeky’ software-programmer culture meant that the linear, cartesian aspects of these media became over-emphasized as a result. The body itself, along with all its organic, surprising, non-programmable implications, was cast to the wayside. Instead, the physical self was to be viewed, in current virtual art and in future applications, as merely a parking space for the mind and eyes, which are the primary means to engage with cyberspace. Either this fate, or the body was doomed to be entered in to a “reductive cyberfantasy of flesh-machine fusion” (pp 9). A baroque approach discards such binary logic in favor of convergence, and treats the physical and virtual realms not as mutually exclusive but complimentary and interdependent. Although Munster’s work deals primarily with the human body, the Cybraphon is, in effect, a body that is created through the movement of physical objects, and the processes of electricity and digital information. Interestingly, the band of artists that created the robot treats it very much as an individual creature. Their website describes it as “image conscious and emotional,“ like an indie rock band painfully aware of the whims of fate. YouTube videos show it performing its clanky, retro tunes alongside human musicians, while the machine has entertained invitations to tour, although, as Iggy Cambell drolly notes, “We want to get it signed to a label…there’s talk of maybe taking it over to Berlin – I don’t know how well it would travel, like most bands it would probably come unhinged.” The Cybraphon is thus an example of what Munster describes as embodied dispersion: The machine is both a physical apparatus and a representation of the scattered thoughts of internet users, both locative and place-centered but unable to exist without its ties to the digital realm. In such artworks, “digital space becomes less an integrated and knowable space…than a heterogenous set of spaces, full of gaps, accidents, and lags” (82). While the Cybraphon is many things: a commentary on current indie music trends, a criticism of fame culture, an elaborate toy, it is also importantly a backlash against a Cartesian treatment of technology. The Cybraphon is a consciously antique, hand-crafted object that digests time-sensitive feeds to sustain its existence: What Munster points out as Deleuze’s idea of ‘folding,’ wherein the form and the process of an artwork cannot be divided without the work itself ceasing to exist. And with this blog post, I hope this bit of publicity makes the Cybraphon very happy. Munster, Anna. Materializing new media: embodiment in information aesthetics. Lebanon: Dartmouth College, 2006. Print. « Manuel Castells: Who has the networking power?